Bits of My Own: Old Aviary Update and Thanks! The first thing I want to do is to thank everyone who left a comment about the bees!I really appreciate it! I guess we were a bit shaken up by the senseless act of violence. Keith was worried that whoever did it would return, and decided not to wait for the weekend to move the hive that was closest to the cemetery. We still don't know if it has a chance, but he wanted to give it every opportunity. He waited until dusk when the bees are quiet, and picked up the hive to move it away from the cemetery, and closer to the center of the property. Well it wasn't exactly a smooth move! The hive started to come apart, and needless to say, the bees were not pleased! He did manage to transfer most of them, but a few remained at the old site. Poor things! They have been through so much! Even with all that uproar, Keith did not get stung! Yesterday early in the morning, he returned to the old hive site and found a cluster of them all huddled onto a stick. He picked up the stick and moved it to the new hive site. The bees were very calm and clung to the stick while he was moving it. Most of the bees have been transferred now, but there are still a few milling around the old site. Keith put the temporary white box (this is the box the bees come in when you buy them), near the site. It was raining last night, and most of the bees went in it, so he is hoping to transfer the rest of them tonight. Who knows if we are doing this right! We are still amateurs at all of this. I guess time will tell. On the weekend we are going to post NO TRESPASSING signs. I don't know if that will do any good or not, but atleast now they have to walk quite a bit onto our property now to get at the hives. 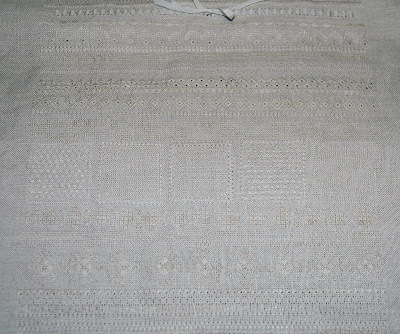 I ran out of the main neutral color silk for the whitework. I contacted Vikki Clayton. She has excellent customer service and sent more very quickly. She was surprised that I ran out and said that she had sold 35 conversion kits for the Old Aviary, and no one else complained. I really don't know what to say about this. I am using single thread, and I am really stingy about the way I stitch with it, using up every bit! As I told her, it really wasn't even close! I only made it halfway through part 2, and had a long way to go. Oh well, I think maybe some of those people ordered it to kit up the project but haven't gotten as far as I did. Still, it bothered me. Makes you wonder if you are doing something wrong. Here is a shot of a finished Part 2. 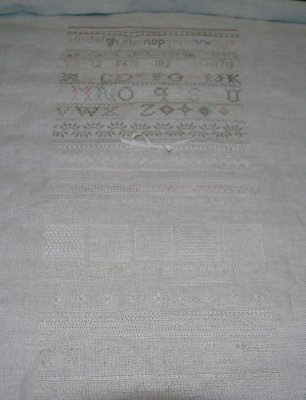 I know this is whitework, and it is supposed to be light, but it does bug me that it doesn't show up a little better. I hope it will show up well enough when it is finished, and I haven't gone through all this for nothing! Here is a shot of parts 1 and 2. I am sorry it doesn't show up a little better. I was considering tea-dyeing it when I am finished. My thinking was that the silk might soak up the dye more than the linen would, and hopefully make it stand out a bit more. Mmm, not sure about that just yet. Well there you have it! That is what I have been working on! My other news is that I have won the Rabbit Rondel drawing on Riona's blog, Oubliette! I am thrilled! I missed the last post about the bees, I can't believe how cruel some people can be! Fingers crossed that the bees do well in their new location. Old Aviary is looking great! Hopefully, the colony of bees to survive and adapt to their new place, there are always people who find pleasure in destroying things, animal, or people, is a shame and sad thing. I really hope the bees make it. And if there is Karma, I hope the vandals get their justs. Your stitching is very, very lovely. All the whitework! It's just beautiful! Your stitching looks so beautiful. I hope that the sign helped and that the problem with those vandals is gone. Old Aviary is so beautiful, you are plowing through it! I hope the rest of the bees make it. I'm just getting around to reading your past couple of posts, and people's cruel and senseless actions never fail to surprise me. I'm so sorry about your hives, but I'm happy that Keith was able to move the hives so well. What a great place you have for bees and other animals. The Aviary is looking wonderful!